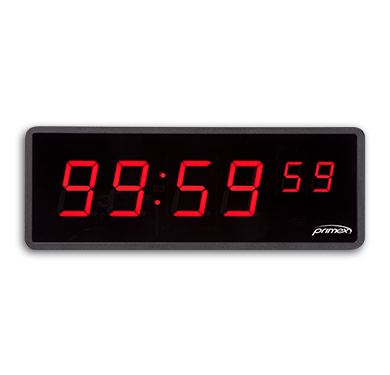 Primex Programmable timers are great for use in schools to count down the remaining time between class changes, or in manufacturing facilities to display the amount of time left for breaks and lunch periods. Our Levo Series Programmable Timers give you the ability to set it and forget it. Simply use the Primex Wireless Event Scheduler Pro Software (sold separately) to create a precise schedule of recurring countdown functions. The timer will begin counting down at each preset time on schedule. When each countdown function is complete the timer automatically displays the correct time, synchronized to every other clock on your Primex Wireless 72MHz/GPS system.